Yuzu - A Japanese citrus fruit with a distinct aroma, this fruit is supposed to have mood-enhancing abilities. Its namesake, a restaurant tucked away in Epicuria Nehru Place definitely falls into that bracket. 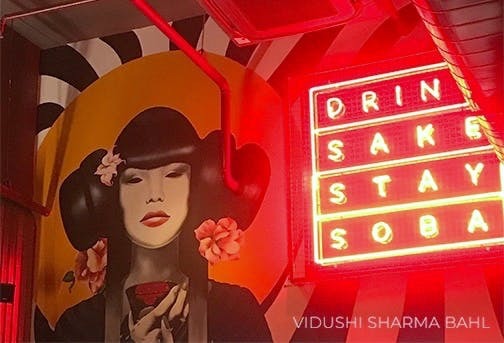 A motif wall with an anime character, a quirky neon post screaming “Drink Sake Stay Soba!”, a snazzy bar & lofty grey open ceilings of the place set the scene for a lively evening with delectable Japanese fare. After being seated, we were given three menus - a usual food, drinks and then a Sake passport. I was enthralled by this little booklet that claimed to be my entry into the world of Sake. I loved how well it was written - informative, crisp & brief. Browsing through this actually made me feel how ignorant I’ve been about this variety of wine that I’d always dismissed as a calorie-dense drink, made to fill up hungry soldiers during wars & famines. Clearly, the trend has changed and Sake is hip & fun in Delhi. Another really cool concept this restaurant has is the sheer absence of Sushi. Yes, you read that right. Delhi finally has an authentic Japanese Restaurant and Sake bar that doesn’t serve sushi. This actually helps you focus on Japanese dishes that you usually would skip out on since you’d already be full with Maki and Nigiri. Delhi would probably take a while to get used to this concept but it's clearly here to stay. The menu is smartly divided and right after the usual starters comprising Edamame & Rock Shrimp Tempura, you can pick your favourite piece of meat and get Yakitori Skewers; the cute chicken diagram is a good addition too. Then we came to the burgers, Japanese Bunless Burgers, Regular Burgers in Brioche or whole-wheat. This is followed by Ramen, Donburi & other meal-in-a-bowl options. And, I was sold with these choices. The restaurant serves a pretty good portion size of everything. They serve probably one of the best versions of the Chicken Katsu Curry I’ve had in Delhi apart from Kofuku. A perfectly fried chicken steak, crisp carrots and Chunks of potato amazingly swam in a lovely golden-hued translucent curry on a bed of sticky rice. The service is pleasant & non-intrusive but our server did definitely need a few more lessons on the dishes & what they comprise of. However, this was just a small hiccup in an otherwise seamless experience. The only let down here is the location. This place is clearly out of the league of restaurants around it. Having to neighbour Lord of the Drinks & the family-friendly Dhaba, this one jostles between them since it’s clientele would probably be very different from the rest. So, if that doesn’t bother you, head here for a fun evening, some lively beats and tons of pretty Sake bottles.